Finouche Alix by Sylvia Natterer is a 48cm tall red haired vinyl doll. 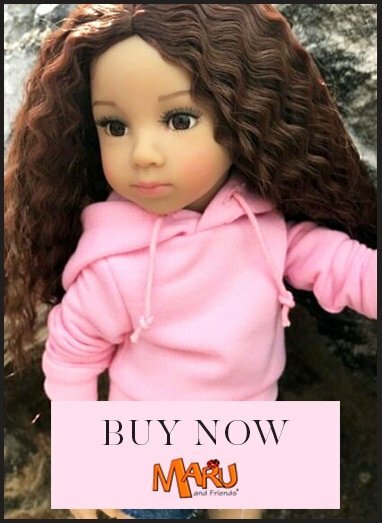 Please note that Alix's hair is not as red as in the photo, more of an auburn with more brown in it.We have added photos of the Alix doll to the listing so you can see her with the auburn hair. Finouche Alix by Sylvia Natterer is a 48cm tall red haired vinyl doll. The Finouche body is modelled on a typical 7-9 year old girl. Finouche's hair is rooted into her scalp, durable and realistic looking. The My Doll Best Friend hairbrush is excellent for detangling without damaging the hair. Extra clothes are available to fit Finouche. Finouche Alix is recommended for children from 5 years old.